Flautist B.V.Balasai has built a reputation for himself as one of the most hardworking and dedicated musicians from the city of Chennai. His Gurus include his father, Shri.B.Sudarsana Rao, Shri.T.Sanjeevi, Shri C.G.Venkatesan and Dr. Prapancham Seetharam. He was performed for many prestigious sabhas, which include programmes held under the auspices of Tirumala Tirupathi Devasthanam, the presitigious Bharath has been performing duets concerts with the Gottuvadyam rather than the usual accompaniment of the violin. He has composed music for dance ballets, devotional albums and has also arranged music for many reputed music directors. At an early age, Balasai had the privilege of being accompanied by great Mridangam stalwarts like Shri. Palghat Raghu, Shri Karaikudi R.Mani, Shri Vellore Ramabhadran and Shri Guruvayur Dorai at his concerts. He has performed extensively in Russia, USA, Canada, U.K. and France; participated in ICCR festivals with Dr.M.Balamuralikrishna, duet concerts in Australia, Sweden Music Festival and Finland JAZZ festival. Chennai’s Bharath Kalachar honoured him with the title of Yuva Kala Bharathi for the year 1998 and also honoured as Asthana Vidwan of Shri Kanchi Kamakoti peedam, Kancheepuram in the year 2002. A versatile artists with a fine professional record, Balasai has inspired music lovers all over the world. N.Ramakrishnan, born to one of Chennai’s most traditional musical families, learnt mridangam under the guidance of his grandfather Shri.T.R.Hari Hara Sharma, Padmashri Shri.T.Vinayakaram, and later under Shri.T.H.Subash Chandran. His accomplishments include “Henry Award” form Music Academy 1998, “Muzhavisai Mani” in Tirutanni and the “Palghat T.S.Mani Iyer’s Memorial Award”. He has also had the privilege of accompanying some of the greatest classical performers including Smt.M.S.Subbulakshmi, Dr.M.Balamuralikrishna, Dr.L.Subramaniam and Shri Ganesh and Shri Kumaresh. His record of international performances include the “Saptakshara” troupe and T.H.Vinayakram in the percussion ensemble conducted by “Chanda Chara” in Stuttgart-Germany. International Percussion Festival in Indonesia being part of the winnders of Unesco Awards, Khajuraho Festival of Dances 1998 for Chandralekha’s “Mahakal” with Dr.M. Balamuralikrishna in Dubai for the Consul General of India’s 50th year of independence Celebrations. “Yantra” in the United States of America for “Jacobs Pillow Dance Festival & Danspace Project (New York), Tokyo summer festival 1996, Festival De Avignon-France, Indian Night Festival and Stuttgart Rhythm Sticks Festival-London. Living unto his great family musical lineage, Ramakrishnan is a thrill to watch on any percussion. On of the leading young violinists in Carnatic Music today, Kalpana Venkat is a multi faceted personality, a violin soloist, an accompanist and a vocalist. A gold medalist in the Masters program in Music from University of Madras and disciple of renowned violin maestro Sangeetha Choodamani Smt.T.Rukmini, Kalpana’s effortless artistry, rich tone and true classicism has own her admirers all over the world. Her numerous titles include the “Sama Gana Priya Sudha” and the “Yuva Kala Bharathi”. She has also won several other awards from The Music Academy, Madras and was featured with other leading musicians in the Jugalbadhi albums “Snehamand Singing Strings” and numerous other recordings with top Carnatic musicians are testimony to her artistry. In the year 2000, “Triveni” featured her in a series of well-acclaimed :Jugalbandhi” concerts with Sivaramakrishna Rao on a tour that spanned France, UK and Switzerland. She has also performed in the United States, Canada, Singapore, South Africa and thhe Middle East. As a performer Kalpana definitely adds commendable value to the international carnatic music fraternity. Paganini, Hendrix, Zappa, Mclaughlin. The Eagles and everything to do with guitar in between, if it could be played on guitar, John Anthony has done it! Starting at the age of 14, his singular guitar style has evolved through 30 years of hard practice, recording and performance. Master Guitarist of the Indian Music scene he has played on over 2000 film sound tracks and music albums spanning jazz, Rock,Pop,Folk and Carnatic. His virtuosity is endorsed by the likes of Zakir Hussain, Dr.Balamuralikrishna, L.Subramaniam, Viku Vinayakaram, L.Shankar and Karaikudi.R.Mani who have defined his guitar sound as truly international, yet distinctly ndian. Not one to take things lying down, Johny was the man being “No More Bhopals” an album that featured several artists in a tribute to the Greenpeace flagship, the Rainbow Warrior ! For this fans, to have heard John Anthony live, is to have truly lived. Sivaramakrishna Rao was initiated into music at a very tender age by his father Shri.B.Sudarsana Rao. He took up the sitar as a child of seven under the guidance of Late Pandit Shri Subba Rao a reputed Sitar and Rudra Veena Vidwan. Later on he became the disciple of the illustrious and veteran sitarist Late Ustad Ahmed Hussain Khan, a flag bearer of the famous Mian Achpal Gharana known of its high standards in traditional Hindustani music. At a very young age, he performed with his brothers and was conferred the title “Laya Brahma” awarded by the music college of Tirupathi, for his rhythmic excellence. He has accompanied Dr.M.Balamuralikrishna in the spirit of freedom concerts for National integration conducted by the BCOC and was awarded “Child Prodigy of the year” in 1990 by the Governor of Tamilnadu, instituted by thr Madras Telegu Academy as a “Ugadi Puraskar” for excellence. His prestigious tours include participation in the Festival “Jugalbandhi” through UK, France, Germany and Switzerland; tour of South Africa in 2002, Mauritius and Singapore in 2003. He has also worked with French guitarist Nadaka in composing a fusion album called “Living Colours” mixing three different styles. Currently composing the music for a feature film titles “Gomathi” slated for the Cannes festival 2004, Sivaramakrishna’s approach to music intellectual, sensitive and artistic. Ganesh rao had his initial training in Tabla from Guru Lakshmana Rao and later came under the tutelage of the Tabla Maestro Late Ustad Keramatulla Khan. From a very young age he has accompanied leading musicians in the Hindustani and Carnatic music field such as Dr.M.Balamuralikrishna, T.V.Gopala Krishnan, Shri.Lalgudi Jayaraman Mitta and Shriram Parasuram. He has played many Jugalbandhis and Thala Vadya Kutcheris on the Tabla accompanying stalwarts like Shri Karaikudi.R.Mani, Shri Umayalapuram Sivaraman, Shri Vikku Vinayakaram and Shri A.K.Palanivel. He also has participated in various prestigious festivals accompanying leading dancers like Dr.Vempatti Chinna Satyam, Dhananjeyans, Nirasimha Chari, Vasanthalakshmi, Shobhana and Meenakshi Seshadri. He has played on a number of recordings with leading music directors, performing extensively all over India, and various countries including Singapore, Malaysia,Srilanka, Maldives, Dubai, USA,Canda,Germany,France and Switzerland. 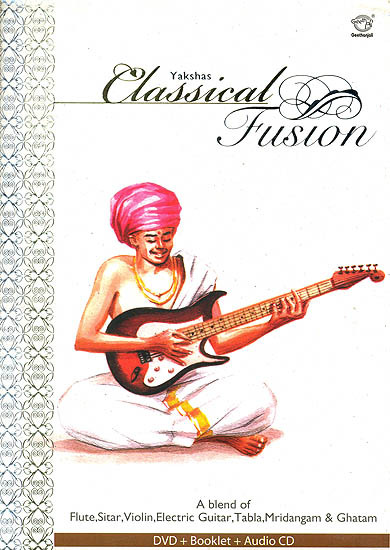 Ganesh’s crisp tonal quality and modulation of sound guarantees an artistic contribution to music. Yakshas, In ancient times Yakshas and Yakshinis were the protectors of Saints and Saviours, giving them the support requires to fulfill their purpose! Flautist Balasai, Sitarist Sivaramakrishna, Violinist Kalpana & Guitarist John Anthony, along with the percussionists Ganesh, Ramakrishnan and Prasanna, from the Yakshas of today. Protecting the rights of their musical heritage! These astounding musicians have mastered their armory of instruments, have now come together to create path breaking music rooted in the classical music Traditions of India. As musical warriors they share a combined experience of over a hundred years! Nice site but before I pay $35 for a cd would surely want to hear sample of .mp4 for quality and clarity. Could you please include that?